نفت و گاز طبیعی یکی از مهم‌ترین منابع تأمین انرژی بشر است. ازاین‌رو در معاملات تجاری و اقتصادی بین‌المللی اهمیت راهبردی دارد و با توجه به اهمیت این دو منبع انرژی، ازجمله سیاست‌های اساسی کشورهای مصرف‌کننده، تأمین مطمئن انرژی و ایجاد امنیت عرضه است. امنیت عرضه، مستلزم بازار باثبات و مطمئنی است که انرژی را با قیمت مناسب برای مصرف‌کنندگان تأمین کند. بخصوص امنیت عرضه گاز به دلیل شرایط طبیعی آن، یکی از اهدافی است که خریداران گاز باید به آن توجه ویژه‌ای داشته باشند. متقابلاً فروشنده گاز با توجه به هزینه‌های هنگفتی که برای استخراج و انتقال گاز صرف می‌نماید، باید به بازار تقاضا و سود حاصل از فروش، اطمینان یابد. مقاله پیش رو، به بررسی یکی از راهکارهایی پرداخته است که در قراردادهای فروش گاز به‌منظور حصول اطمینان دوجانبة خریدار و فروشنده از میزان عرضه و تقاضا گنجانده می‌شود. همچنین با معرفی شرط تحویل یا پرداخت، به‌عنوان یکی از شروط منعطف‌کننده قرارداد گاز، به بررسی این شرط از منظر حقوق کشورهای مختلف می‌پردازد و در نهایت، نه‌تنها جهت درج این شرط در قراردادهای فروش گاز، ممنوعیتی نمی‌یابد، بلکه آن را طبق قواعد حقوقی حاکم، لازم‌الاجرا می‌داند. Since oil and natural gas are the most important sources of energy, they are strategically crucial for international trade and economic transactions. For this purpose, consumer countries strive to secure the supplement of oil and gas. This requires a stable market, capable of providing energy at a reasonable price. Given the natural characteristics and conditions of gas, such as the difficulties for its storage, more importance should be attached to the supplement of gas, hence, gas sellers always need to be assured about the demand and profit in the market. This article examines one of the clauses employed in gas sale contracts so that the buyers and sellers can both make sure about the demand and supply rates in the market. It also defines the take-or-pay clause as a mechanism that can make gas contracts flexible and studies this clause from the perspective of the legal systems in different countries, especially in Iran. It eventually concludes that there is no prohibition in Iranian legal system for incorporation of take-or-pay clause in gas sale contracts. In contrast, the usage of this clause is permissive under the Iranian positive law and will remain binding for the parties. انصاری، شیخ مرتضى؛ مکاسب، چاپ دوم، قم، انتشارات علامه، 1367. شهیدی، مهدی؛ حقوق مدنی 6، مجد، 1382. _________؛ حقوق مدنی، تشکیل قراردادها و تعهدات، مجد، 1380. طباطبایی یزدی، سید محمدکاظم؛ حاشیه‌المکاسب، مؤسسه اسماعیلیان، 1378 هـ .ق، جلد اول. کاتوزیان، ناصر؛ دوره مقدماتی حقوق مدنی، درس‌هایی از عقود معین، جلد 1، گنج‌ دانش، 1384. _________؛ «دوره مقدماتی حقوق مدنی، درس‌هایی از عقود معین، جلد دوم، چاپ پنجم، گنج‌ دانش، 1382. ________؛ قانون مدنی در نظم حقوقی کنونی، چاپ چهل‌وششم، ویرایش چهارم، میزان، 1394. _________؛ عقود معین، معاملات معوض تملیکی، جلد اول، شرکت سهامی انتشار، 1384. قاسم‌زاده، سید‌قاسم؛ اصول قراردادها و تعهدات، جلد دوم، دادگستر، 1383. محقق حلی؛ شرایع‌الاسلام، چاپ دوم، جلد دوم، استقلال، 1409 هـ .ق. 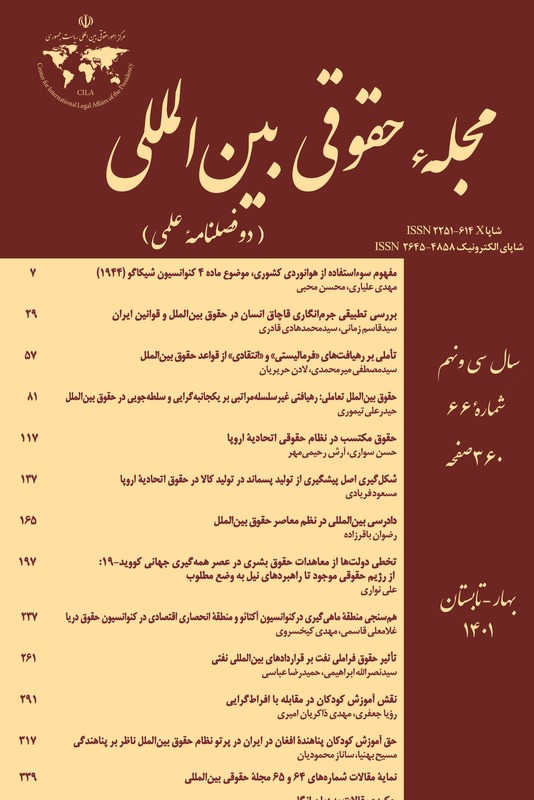 داراب‌پور، مهراب؛ «ثمن شناور»، مجلهتحقیقاتحقوقی، دانشگاه شهید بهشتی، شماره 21ـ22، 1376 و 1377. علیخانی، محمد؛ «بررسی وضعیت حقوقی مبیع و ثمن در قراردادهای بین‌المللی فروش گاز»، مجله حقوقی بین‌المللی، شماره 40، 1388. عادل، مصطفی؛ «توافق بر خسارات در قراردادها»، مجله دانشکده حقوق‌وعلوم‌سیاسی دانشگاه تهران، شماره 53، پاییز 1380. Chandra, Vivek, Fundamentals of Natural Gas: An international Perspective, PennWell Corp., 2006. Guest & et al, Benjamin's Sale of Goods, London, Sweet & Maxwell, 7th revised edition, 2006. Hoffman, Scott L., The Law and Business of International Project Finance, 3rd ed., 2008, Cambridge University Press, 2014. O’Neill, Daniel, Gas Sale and Purchase Agreements, in Oil and Gas – A Practical Handbook (G. Picton-Turbervill, ed. ), Globe Business Publishing Ltd., 2009. Marsh, P.D.V, Comparative Contract Law, England Gower Publishing, 1994. O'Sullivan and Hilliard, Jonathan, The Law of Contract, Oxford University Press, 2nd ed., 2006. Ash-Taylor, James, “EU Competition Law and Third-Party Access to Gas Transmission Networks”, Utilities Law Review, Lawtext Publishing Limited, No. 14, [2004/2005, available at: http://www.gibsondunn.com/ fstore/documents/pubs/ULR%2014-3-text%20105-110amended.pdf, 2016. Baker, Scott & D. Krawiec, Kimberly, “Incomplete Contracts in a Complete Contract World”, Florida State University Law Review, vol. 33, available at: http://scholarship.law.duke.edu/ faculty_scholarship/2038. Ben-Shahar, Omri, “'Agreeing to Disagree': Filling Gaps in Deliberately Incomplete Contract”, 2004, Law & Economics Working Papers Archive: 2003-2009, Art. 2 , http://repository.law.umich.edu/law_econ_archive/ art2. Crowder, Angela Jeanne, “Take-or-Pay Payments and Settlements - Does the Landowner Share?”, Louisiana Law Review, vol. 49, Issue 4, March 1989, available at http://digitalcommons.law.lsu.edu/cgi/viewcontent.cgi? article=5177&context=lalrev. Creti, Anna, “Long-term Contracts and Take-or-Pay Clauses in Natural Gas Markets, University of Toulouse, October 2003. Dörig, Markus, “Supreme Court Rules on Contractual Penalties”,Int’l L. Off., http://www.internationallawoffice.com/Newsletters/Company-Commercial/ Switzerland/BADERTSCHER-Rechtsanwlte-AG/Supreme-Court-rules-on-contractual-penalties, 2017. E. Masten, Scott & Crocker Keith J., “Efficient Adaptation in Long-term Contracts: Take-or-Pay Provisions for Natural Gas”, The American Economic Review, December 1985. Looper, Scott, “Take-or-Pay Crisis v2.0- What Wind Power Generators and Providers Failed to Learn from Gas Pipelines?”, Houston Journal of International Law, 1980, vol. 33. Holland, Ben & Ashley, Philips, “Enforceability of Take-or-Pay Provisions in English Law Contracts”, Journal of Energy & Natural Resources Law, vol. 26, No. 4, 2008. Holland, Ben and Phillip Spencer Ashley, “Natural Gas Price Reviews: Past, Present and Future”, Journal of Energy & Natural Resources Law, vol. 30, Issue 1, 2012. J. M. Medina, “The Take-or-Pay Wars: A Cautionary Analysis for the Future”, Tulasa Law Review, vol. 27, Issue 2, (1991-1992). Kotlowski, Aleksander, “Third-Party Access Rights in the Energy Sector: A Competition Law Perspective”, Utilities Law Review, vol. 16, No. 3, [2006/2007]. Marc Iynedjian, “Gas Sale and Purchase Agreements under Swiss Law”, ASA Bulletin, (Kluwer Law International), 2012, vol. 30, Issue 4. Mavromati, Despina, “Excessive Contractual Penalties in Football”, SSRN, November 18, 2016. Petrash, Jeffrey M., “Long-term Natural Gas Contracts: Dead, Dying, or Merely Resting?”, Energy Law Journal, vol. 27, 2006. Scott Robert E., “Conflict and Cooperation in Long-term Contracts”, California Law Review, vol. 75, Issue 6, 2005. Talus, Kim, “Long-term Natural Gas Contracts and Antitrust Law in the European Union and the United States”, Journal of World Energy Law and Business, 2011, vol. 4, No. 3. Villar, Jose A., “The Relationship between Crude Oil and Natural Gas Prices”, Energy Information Administration, Office of Oil and Gas, October 2006. K. Cahill and M. Cooke, “High Court ruling Impacts Take-or-Pay Clauses”, 7 December 2012, available online at http://www.lexology.com, 2014. E-Nike Ltd. v. Department for Communities and Local Government  EWHC, 2012 EWHC (High Court of England and Wales). Interstar Wholesale Finance Pty. Ltd. v. Integral Home Loans Pty. Ltd. 2008. Royce Realty & Dev., Inc. v. Arkla, Inc., (Okla, 1993).